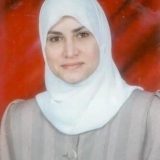 Wafa Ahmad is one of five women on the Jordan Istiklal Hosital staff. As a consultant, she helps with over 800 patients in the field of internal medicine and has plenty of discussions with members of the board regarding cases. Before her current position, she was at another hospital in the intensive care unit, meanwhile getting divorce. She had plans to continue her education but because of their divorce, the continuation of her studies stopped. However, she does intend to pick up where she left off in continuing her education. She speaks in her hospital about health education and lectures at private schools on higher education, medical education and oncology education. Her goal is to work in the private sector and possibly train future doctors. She is proud to be one of the five women of her staff, in an position with little stability being in Jordan—all while being a single mother. She looks forward to her certification to be a Internal Physician. She maintains her strong work ethic and core values.